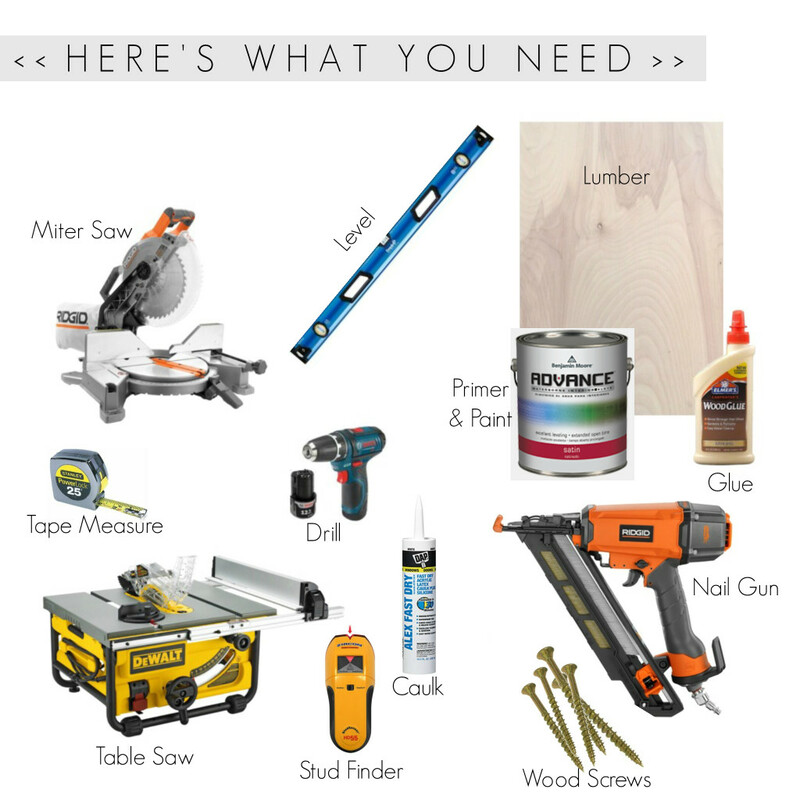 Step 1: First you will need to purchase your lumber. 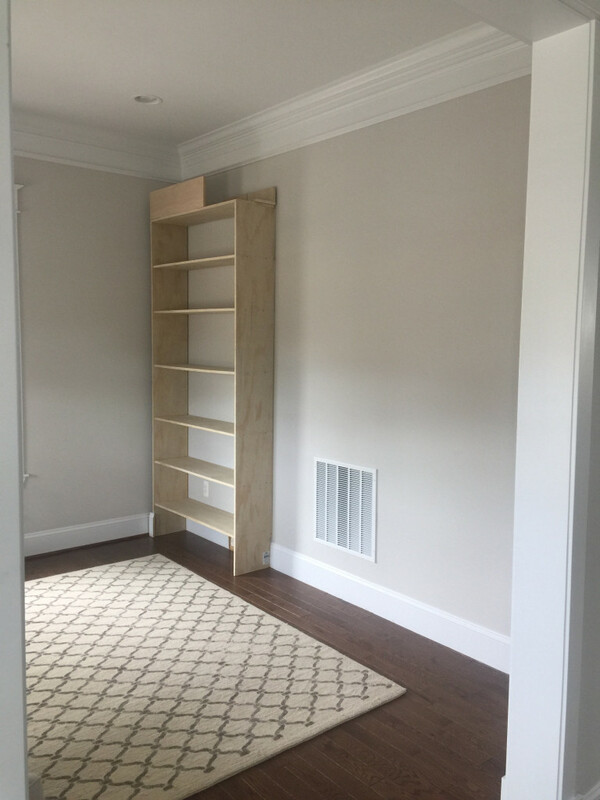 These bookcases were ultimately going to be painted so I chose our wood with that in mind. You may choose different types of wood if you intend on staining your finished project. 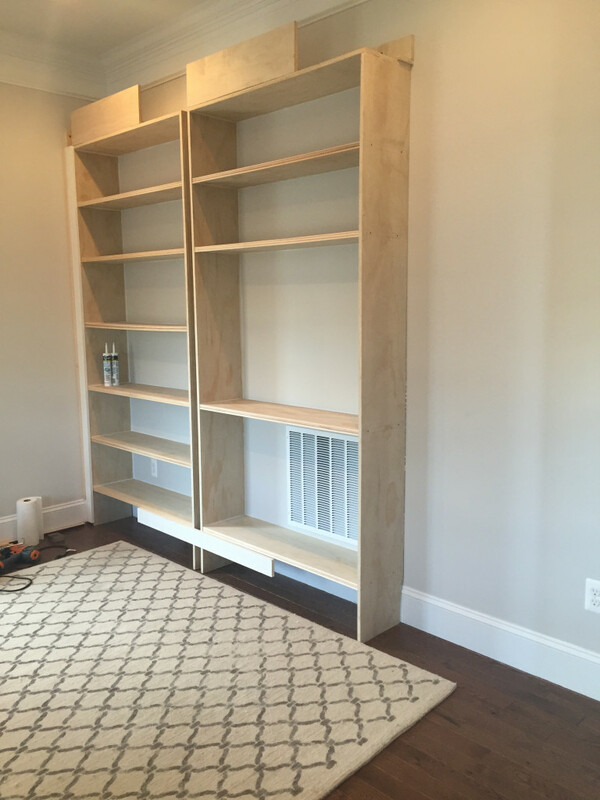 For this project I chose cabinet grade plywood for the bulk of the built-in. 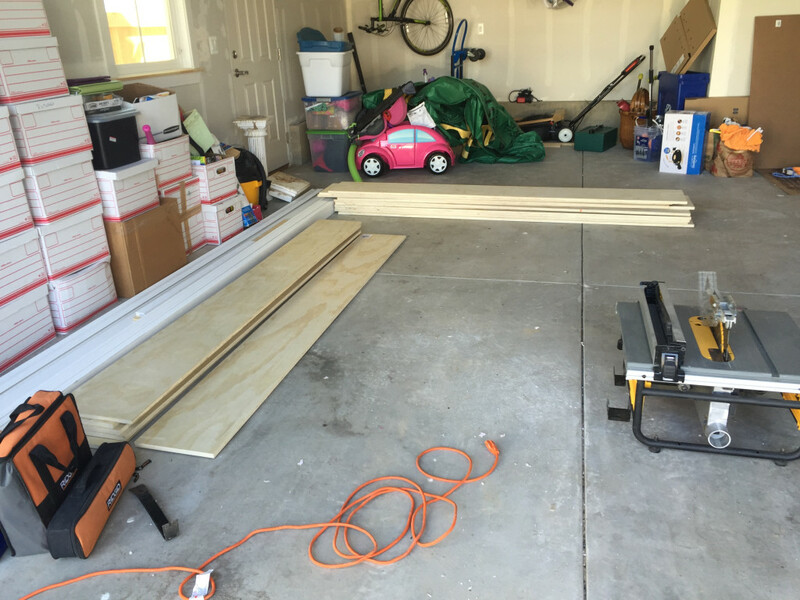 I needed 4 sheets of plywood measuring 4′ X 8′ X 3/4″. To make these pieces more manageable I had the hardware store rip the plywood down to pieces that measured approximately 12″ wide X 8′ long. 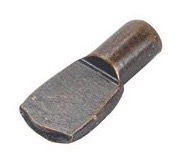 This will allow me to cut them more easily on my table saw at the project site. 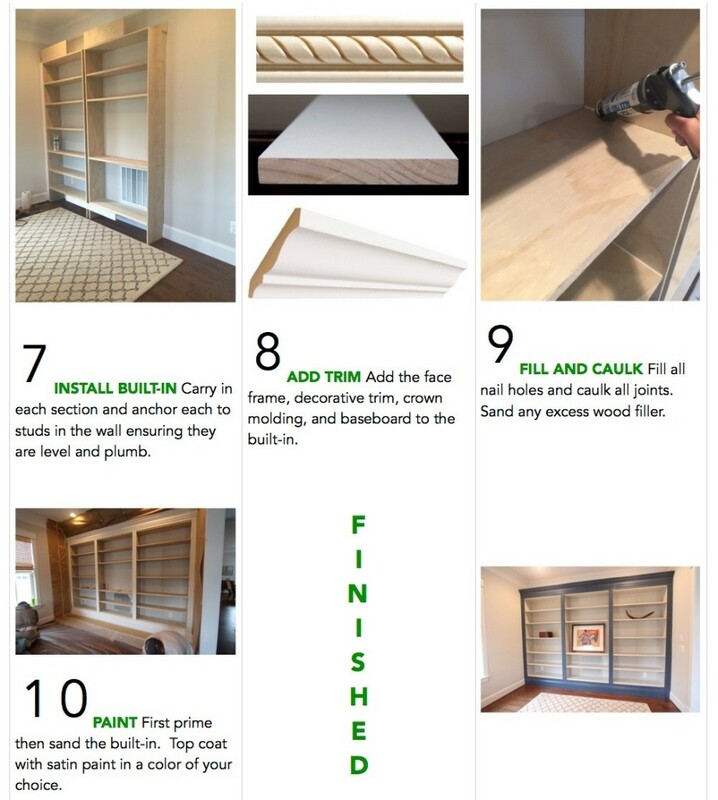 I also purchased wood for the face frame, decorative trim that will be used to face the front of each shelf, and material for both the baseboard and crown molding. 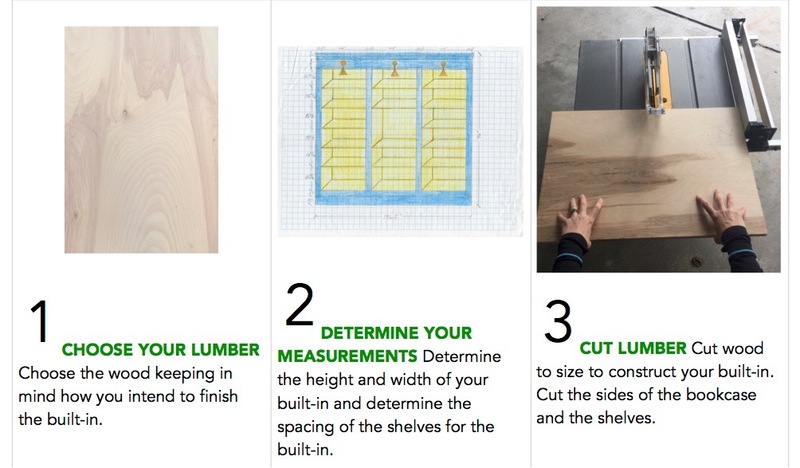 Step 3: Cut your lumber to size. 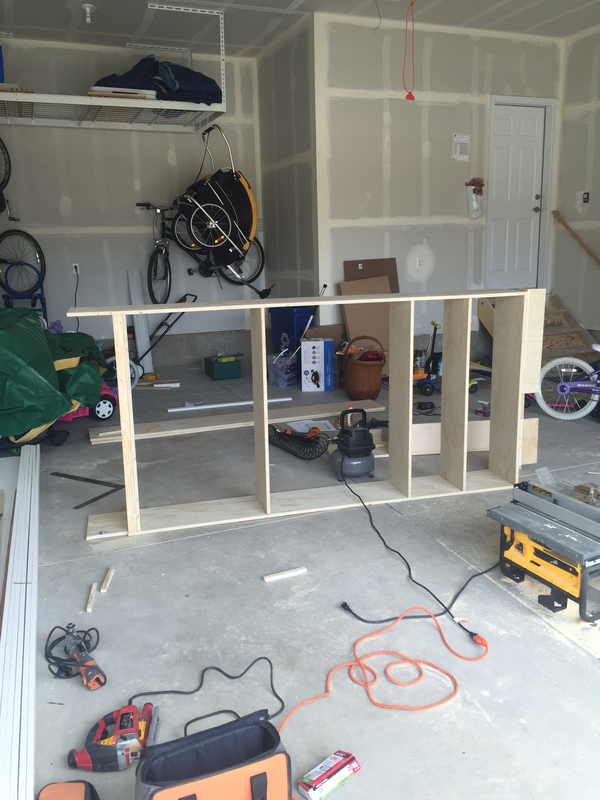 First I cut each side of the bookcase shell to 12″ wide X 8′ long. 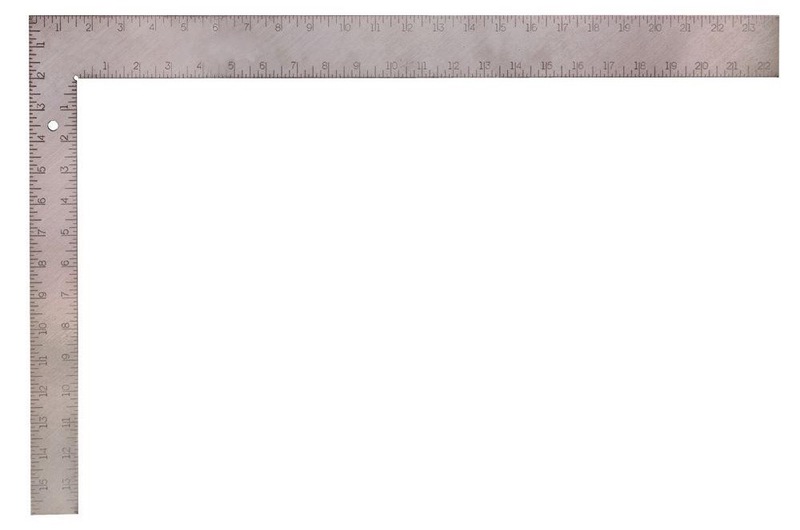 There are three sections so I needed 6 sides that measured 12″ wide X 8′ long. Next I cut each shelf to size. 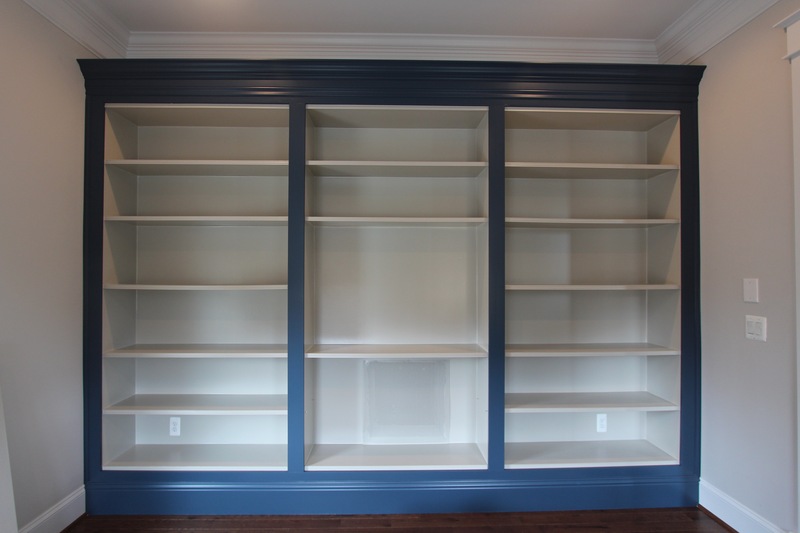 There were 17 shelves each measuring 44″ long X 11 1/4″ wide. 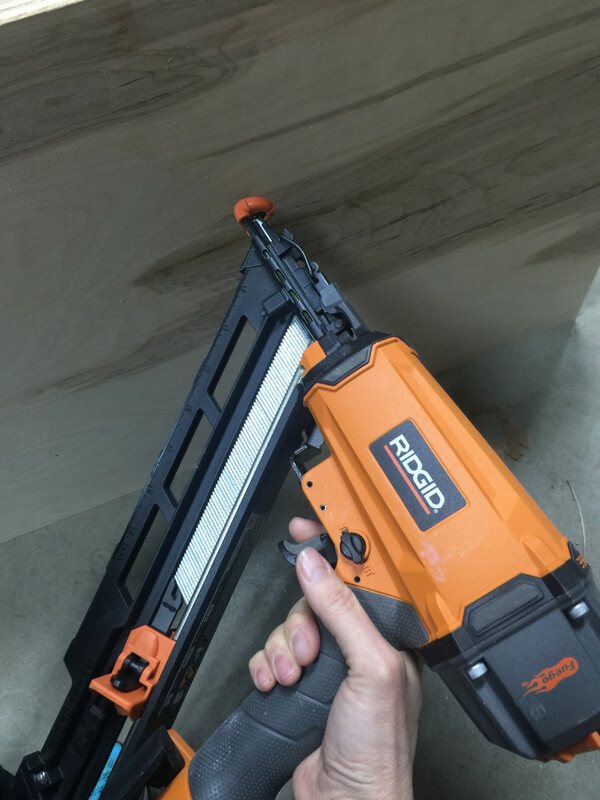 For the top 3 “shelves” I cut a a piece of wood that was 1 1/2″ longer and 3/4″ wider than the other 17 shelves. 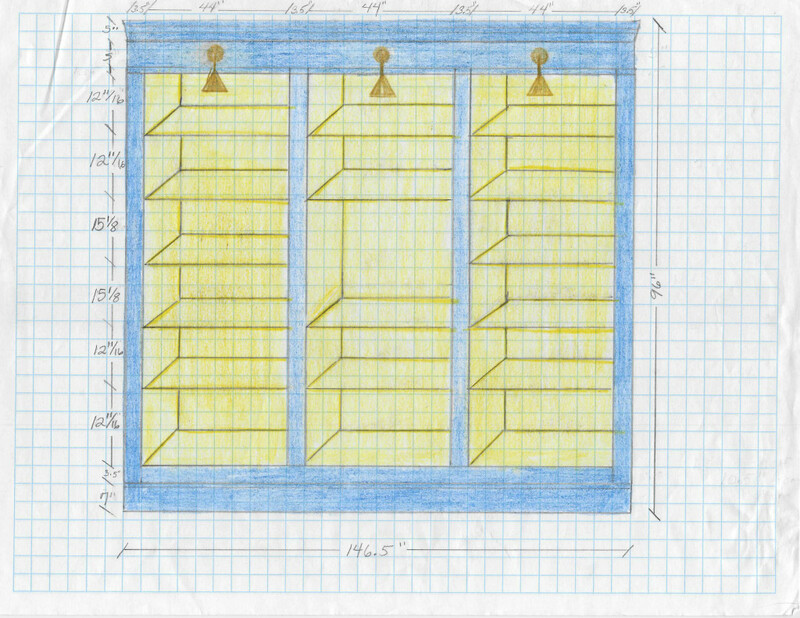 The 3 tops “shelves” measured 12″ wide X 45 1/2″ long. The purpose of making these larger because they will be attached to the tops of the sides as opposed to set in-between the sides like the other 17 shelves. Step 4: Measure and mark each side of the bookcase where each shelf will fall. 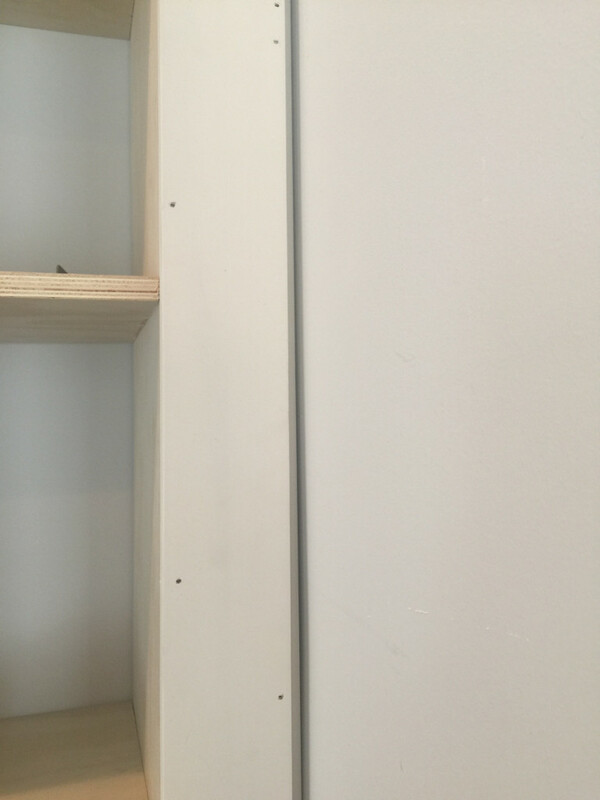 Using an L-square ruler draw a straight line as a guide so that you attach each shelf straight. I measured and marked both sides of the bookcase sides to ensure that I nailed and screwed into the center of each shelf. 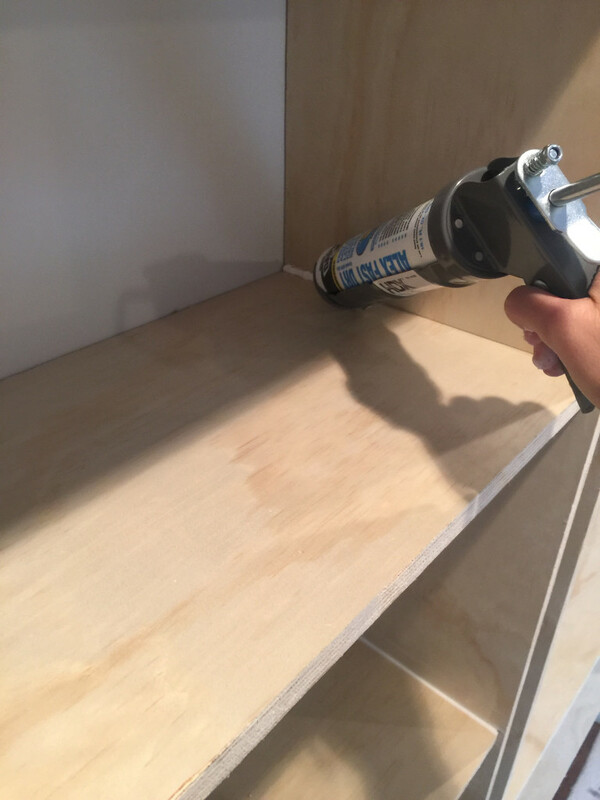 Step 5: Apply glue to the end of each shelf. Then using a nail gun nail through the bookcase side into each shelf. Nailing first will hold the shelves in place. 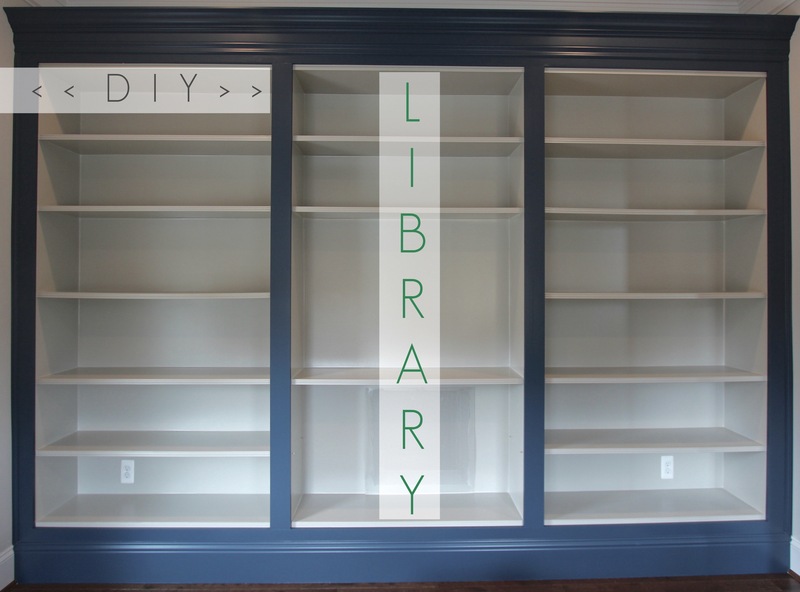 Repeat this process for every shelf and for both sides of the bookcase. 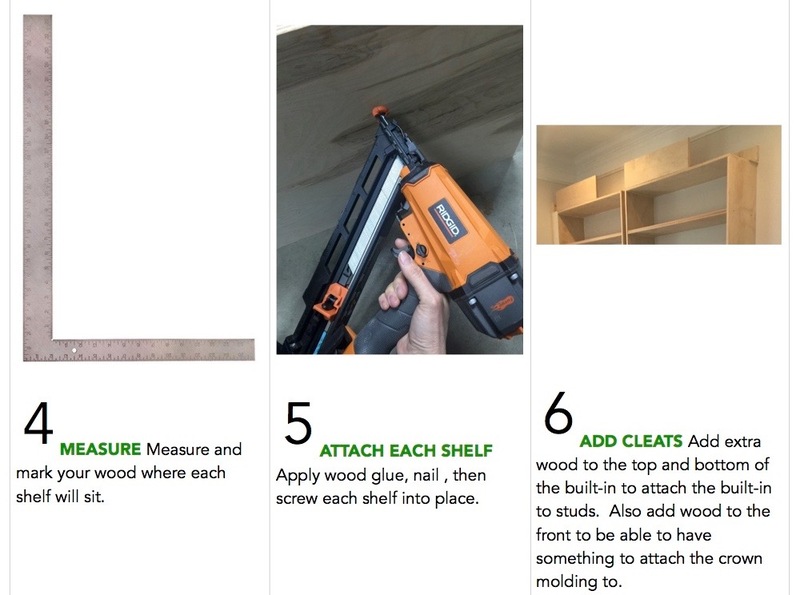 Then using a drill screw 2″ wood screws into each shelf. This will cinch the shelf tighter to the side. Wipe up any excess glue with a damp rag as it gets squeezed out since the glue will dry quickly. Step 6: Above the three top “shelves” and below the bottom shelves I added cleats (wood blocking) that allowed me to screw each section into a stud making the overall unit very secure. I also added to the front of the top of the bookcase extra wood that would allow me to later have something to attach the crown molding to. Step 7: Now to carry in each section. Each section is BIG and HEAVY so for this part I needed to enlist some extra muscle. 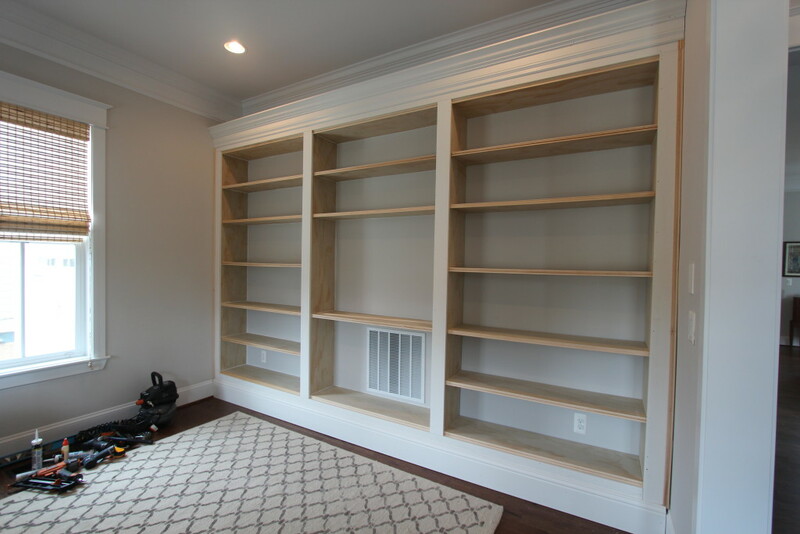 With the extra hand I carried in all sections of the bookcase and using the previously attached cleats, both above the top shelf and below the bottom shelf, anchored the three sections to studs using 3 1/2″ wood screws. Before anchoring each section into place ensure they are level and plumb. Shim if necessary. 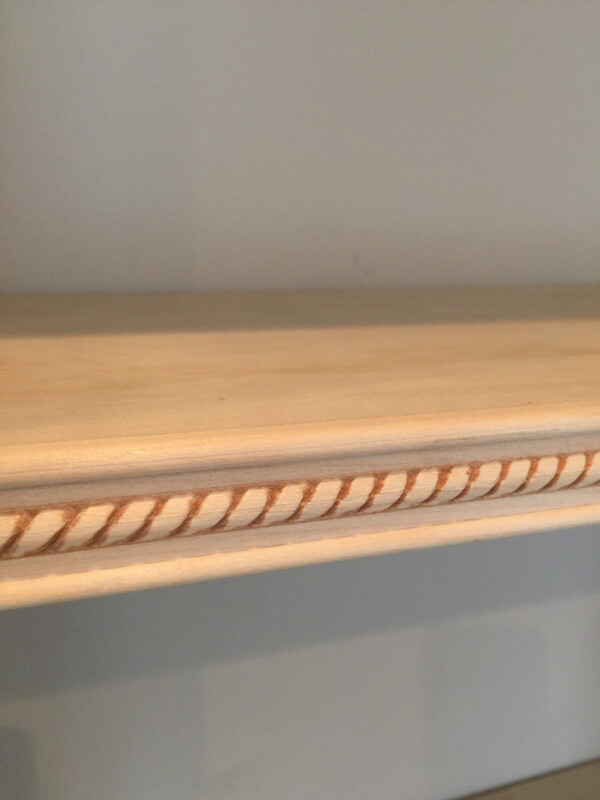 Step 8: Once all sections are secured to the wall I began adding the decorative trim to the front of each shelf. 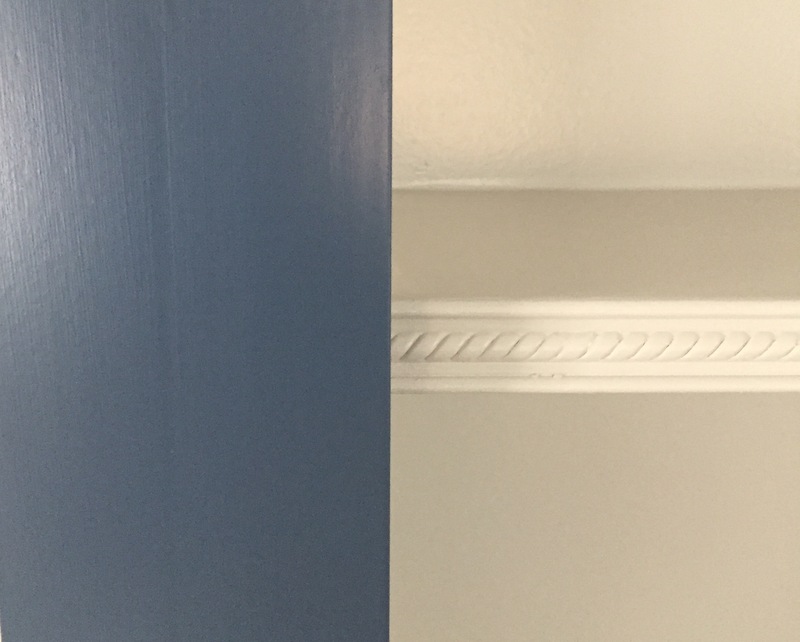 The homeowner wanted this trim to be detailed without being ornate. I chose a decorative trim with a rope detail embossed on the front. For the face frame I used 1 X 4 finger jointed primed lumber. 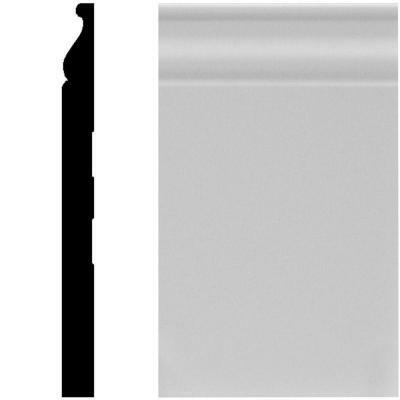 The vertical members of the frame are stiles and the horizontal members are known as the rails. I first attached the bottom rail just below the bottom shelf but just above the baseboard and extends all the way across from wall to wall. I then added the 4 stiles of the face frame that sit just on top of the bottom rail and hide the fronts of the vertical plywood sections of the bookcase. Sitting above the 4 stiles I added the top rail that again extended across all three sections stretching from wall to wall. I then added the crown molding. To make the crown molding look larger I first flipped a piece of baseboard upside down and attached the crown molding above that. 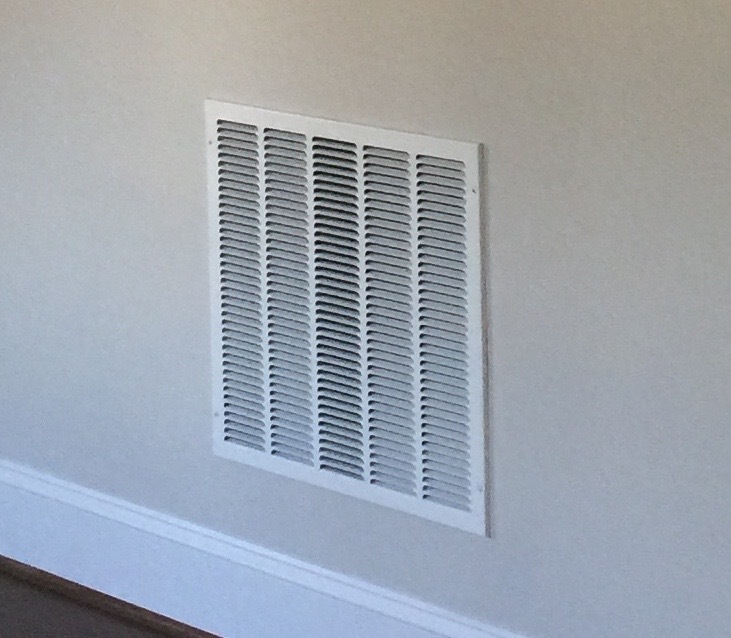 This technique gives you a really nice large looking crown molding. For the baseboard I coordinated the bookcase base with the homeowners existing baseboard. 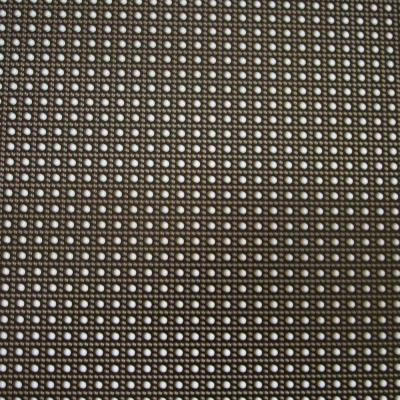 No wall is perfectly straight. 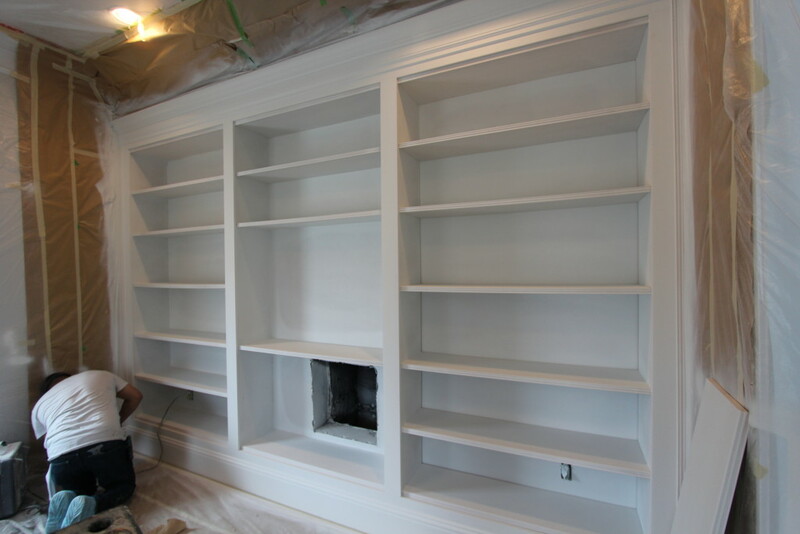 But our bookcases were built square and made level and plumb prior to installing. That means you are likely to have a gap between where the face frame of the bookcase and the wall meet. To hide this gap I added the same decorative trim that I used on the face of each shelf and ran it over the gap between the face frame and the wall. Step 9: Fill all nail holes with wood filler and caulk all joints. 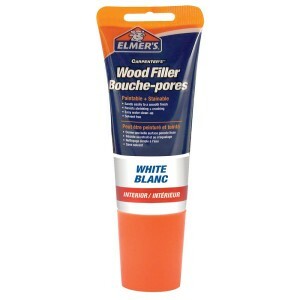 Sand any excess wood filler prior to painting. 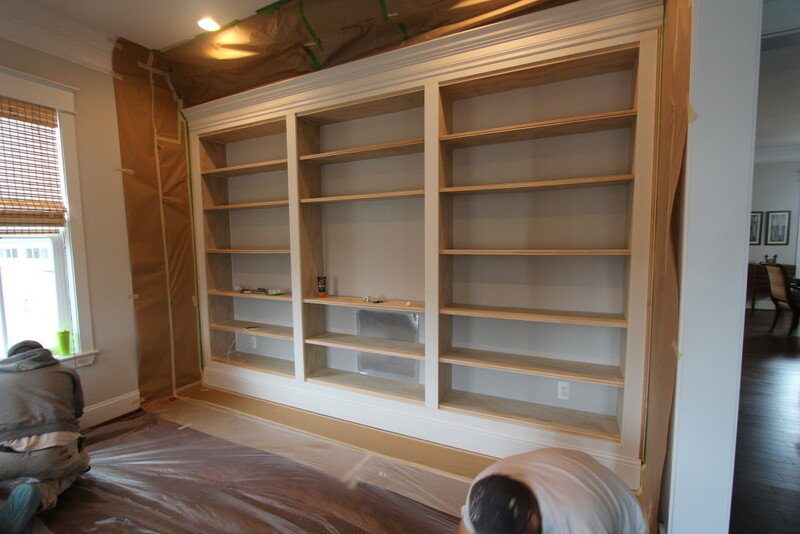 Step 10: For this project I had the painters paint the bookcases using a sprayer. Spraying the paint will produce a beautiful finish with no brush strokes and it will be completely painted in one day! An added bonus for a lot of surface area. 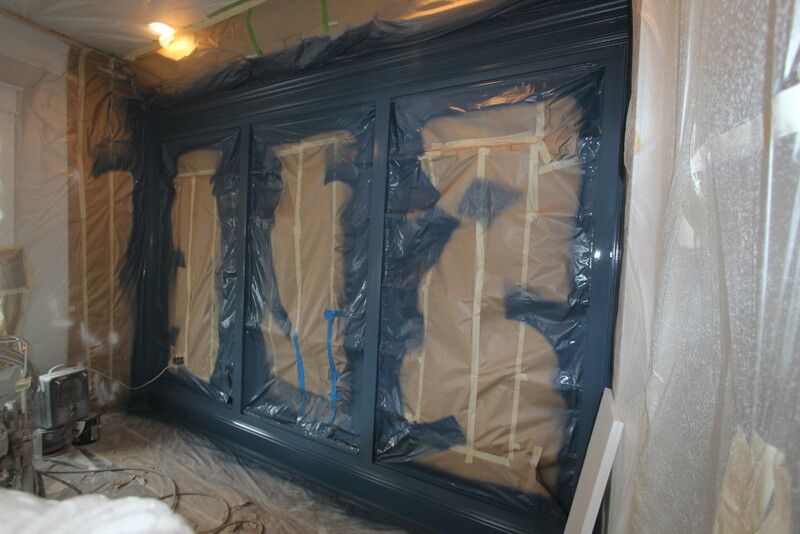 First the painters taped off the surrounding areas to protect them from overspray. Then the painters primed the entire bookcase. 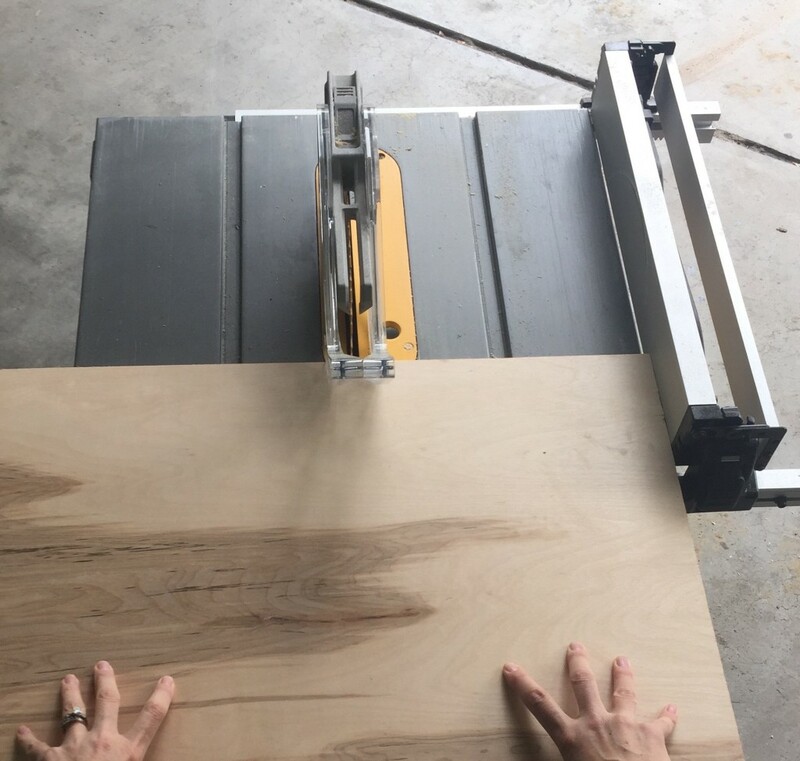 When you prime raw wood it will raise the grain of the wood making the surface feel rough. 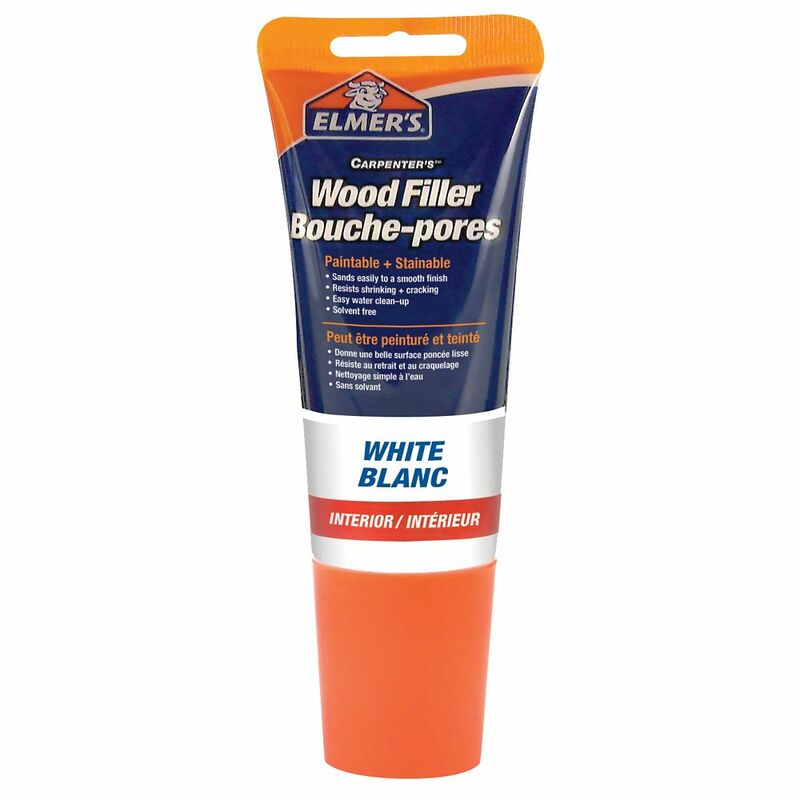 Lightly sand all surfaces so that it feels smooth. Then with a tacky cloth remove the dust. Topcoat with your paint. 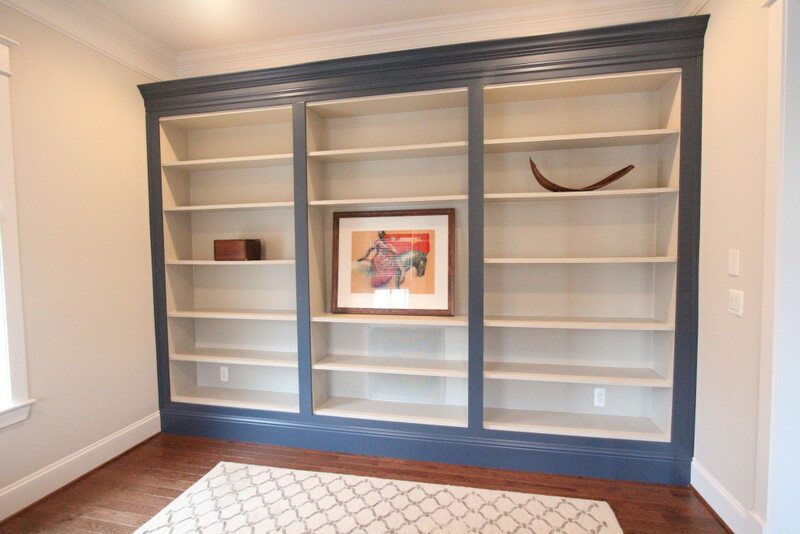 The homeowner and I chose a navy blue paint by Benjamin Moore called Newburyport Blue (HC-155) for the face frame of the bookcase and a gray/tan also by Benjamin Moore called Revere Pewter (HC-172) for the inside of the bookcase. I think it turned out great! These custom built-ins have transformed this room and have given this space purpose! That’s it!!! Every time someone walks in their front door they will be wowed by this addition!